A SpaceX Falcon Heavy rocket has scored a complete success on its first operational mission. The Falcon Heavy launched from Kennedy Space Center Launch Pad 39A at 6:35 p.m. EDT today. Launch was delayed four days due to a number of technical and weather concerns, but today’s launch occurred on time with no delays. This was the second launch of a Falcon Heavy, following a demonstration flight in February, 2018. The rocket launched today employed three Block 5 boosters, each being flown for the first time. The two outside boosters successfully landed at Landing Zones 1 and 2 on Cape Canaveral Air Force Station, while the center booster was successfully recovered on the “Of Course I Still Love You” drone ship stationed on the Atlantic Ocean about 300 miles east of Cape Canaveral. The rocket’s payload, the Saudi Arabian Arabsat-6A satellite, was successfully deployed about 34 minutes after liftoff. Seasoned rocket watchers and journalists agree that this was one of the most spectacular launches ever, citing a crystal clear sky, the loud noise of the 27-engine launcher and the landing of the two boosters on the Cape heralded by a total of four deafening sonic booms. This was a major success for SpaceX, which hopes to continue to launch Falcon Heavy rockets on a variety of heavy-lift missions for commercial and government customers. Arabsat-6A, operated by King Abdulaziz City for Science and Technology, is the most advanced communications satellite built by Lockheed Martin. It will be stationed in a geostationary orbit about 22,000 miles above Earth at 30.5 East Longitude. The 14,000-pound satellite will provide television, Internet, telephone and secure communications to customers in the Middle East, Africa and Europe. The satellite has a planned design life of 15 years. Today’s scheduled launch of a SpaceX Falcon Heavy rocket has been scrubbed. 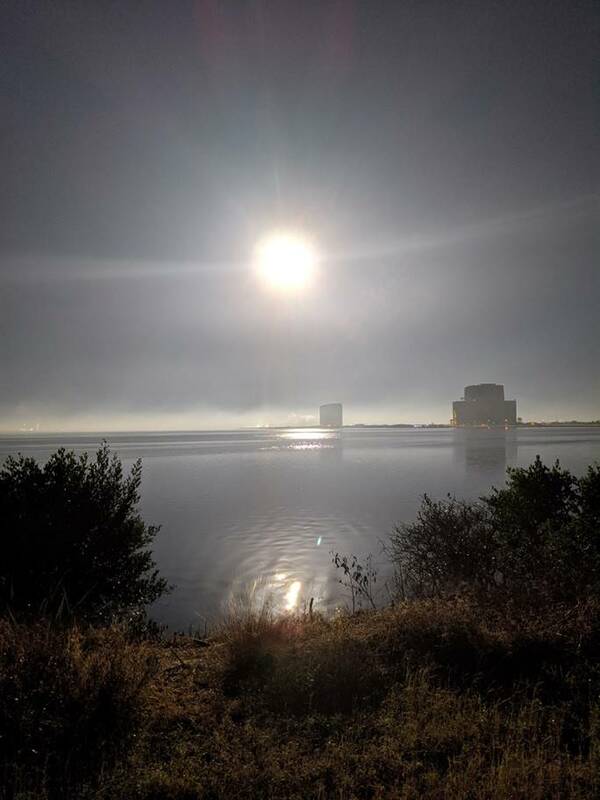 Launch was originally scheduled for Sunday, April 7 but slipped to Tuesday, April 9 to allow an increase in the time to complete launch preparations. Launch was rescheduled to today due to a poor weather forecast on Tuesday. Today’s launch attempt was the first actual countdown for this mission. The launch window opened at 6:35 p.m. EDT but the launch was postponed to 8:00 p.m. EDT to allow for an increase in the time needed for launch preparations. Launch was ultimately postponed to the close of the launch window at 8:32 p.m. EDT due to unacceptable high altitude winds which would cause strong wind shear capable of tearing the rocket apart in flight. Launch was scrubbed about an hour before the close of the launch window as it became clear that wind conditions would not improve sufficiently to allow a launch today. Launch has been rescheduled for Thursday, April 11 during a launch window which extends from 6:35 p.m. to 8:32 p.m. EDT. This will be the second launch of a Falcon Heavy rocket and its first operational mission, carrying the Arabsat-6A communications satellite for Saudi Arabia. A United Launch Alliance Delta IV rocket successfully launched the WGS-10 satellite for the Air Force at 8:26 p.m. EDT today from Launch Pad 37B on Cape Canaveral Air Force Station. Launch was originally scheduled for March 13, 2019 but was postponed to allow troubleshooting of a technical issue with the rocket. Today’s launch was scheduled for 6:56 p.m. EDT but slipped to 7:11 p.m. EDT due to delays in pre-launch processing. Launch was further delayed to 7:52 p.m. EDT as engineers tackled technical issues with the rocket’s first and second stages. Launch was postponed to 8:26 p.m. EDT as problems with the NASA Tracking and Data Relay Satellite (TDRS) system were resolved. The TDRS system is required in order to provide telemetry support and ascent data from the Delta IV after it is launched. The Delta IV rocket launched today was the 5,4 version, featuring a five-meter payload fairing and four solid rocket boosters. The first stage produced a liftoff thrust of about 705,000 pounds, augmented by a thrust of about 281,000 pounds from each solid rocket booster. The 13,200-pound WGS-10 satellite was successfully deployed about 36 minutes after launch. The satellite is currently on its way to geostationary orbit about 22,000 miles above Earth. WGS-10 is the tenth satellite in the Air Force Wideband Global SATCOM (WGS) constellation. As the backbone of the U.S. military’s global satellite communications, WGS provides flexible, high-capacity communications for the nation’s warfighters, including marines, soldiers, sailors, airmen, the White House Communications Agency, the U.S. State Department, international partners and other special users. The WGS system is composed of three principal segments. These are the Space Segment (satellites), the Control Segment (operators) and Terminal Segment (users). The WGS satellites are the Department of Defense’s highest capacity communications satellites. Each satellite provides service in the X and Ka frequency bands, with the ability to switch back and forth from these bands as needed. Each satellite is digitally channelized and transponded. These characteristics provide a described “quantum leap” in communications capacity, connectivity and flexibility for WGS users. Just one WGS satellite provides more capacity than the entire Defense Satellite Communications System (DSCS) constellation, which WGS is augmenting and ultimately replacing. WGS satellites are manufactured by Boeing Defense, Space and Security corporation. Bridenstine encouraged his troops with a story about a chat he had with a KSC visitor who was staying at his hotel. “She ran into somebody at the Kennedy Space Center and she asked him what he did, and he said, ‘Well, I’m helping us to go to the Moon and Mars’”. She said, “Okay, well what do you do?” And he said, “I’m a custodian.” It was Bridenstine’s way of underscoring the commitment of everyone at NASA to help the United States establish a permanent outpost on the Moon as a stepping stone to the Universe, beginning with a Mars mission, not just those employees working on Orion and the Space Launch System (SLS). Bridenstine said this year’s budget reaffirms a commitment to the SLS, the Webb Telescope, Orion, Exploration Mission-2 (the first crewed NASA space vehicle since the Space Shuttle), and a small space/transfer station called Gateway, which will orbit the moon by the mid-2020’s. Gateway would be the means to deliver payloads, ferried up from Earth, to the Moon’s surface. Plans are to return Americans to the Moon by 2028, with a permanent base to follow. That lunar base would be a stepping off point for travel to Mars. This was welcome news to the “Moon To Mars” audience, especially KSC employees, who have been suffering from a recession following the retirement of the Space Shuttle in 2011. The future is bright, as was beautifully exemplified in today’s seminar. An unmanned SpaceX Crew Dragon space capsule successfully completed a six-day mission to the International Space Station (ISS) with a splashdown on the Atlantic Ocean about 230 miles east of Cape Canaveral on-time at 8:45 a.m. EST today. Splashdown occurred about six hours after the spacecraft made an autonomous undocking from ISS. Crew Dragon was quickly recovered by a brand new SpaceX recovery vessel. This marks a major milestone for SpaceX and NASA, as the successful mission paves the way for manned spaceflights aboard the Crew Dragon, which could occur as early as July, 2019. The Crew Dragon Demo-1 flight, launched from the Kennedy Space Center on March 2, 2019, achieved several important firsts. These include the first commercially built and operated American crew-rated spacecraft to visit ISS, the first autonomous docking and undocking of an American spacecraft to and from ISS and the first use of a new, global design standard for the adapters that connect ISS and Crew Dragon which will also be used for the future NASA Orion spacecraft on its mission to the Moon. This was an exciting mission for SpaceX and NASA, as the space agency seeks to begin the first manned spaceflights from U.S. soil since the retirement of the Space Shuttle in 2011. A SpaceX Falcon 9 rocket successfully launched the Crew Dragon Demo-1 mission at 2:49 a.m. EST today from Launch Pad 39A at the Kennedy Space Center. The unmanned Crew Dragon spacecraft was deployed on an International Space Station (ISS) transfer orbit about 11 minutes after launch. The Falcon 9 first stage booster employed today was being flown for the first time and was successfully recovered on the “Of Course I Still Love You” drone ship positioned about 300 miles east of Cape Canaveral on the Atlantic Ocean. The spacecraft, being flown for the first time for the NASA Commercial Crew Program, is scheduled to dock with ISS on Sunday, March 3 at about 6:00 a.m. EST after performing a series of phasing maneuvers. In a departure from the cargo-carrying Dragon capsule which is grappled and berthed to ISS, Crew Dragon will autonomously dock with ISS on a port last used for the docking of Space Shuttle Atlantis during mission STS-135 in July, 2011. Although uncrewed, Crew Dragon carries about 400 pounds of crew supplies and equipment. Crew Dragon will remain docked to ISS for five days. The spacecraft will autonomously undock from ISS at about 2:30 a.m. EST on Friday, March 8. About five hours after Crew Dragon departs ISS, it will conduct its deorbit burn which will last about 15 minutes. It will take about 40 minutes for Crew Dragon to return to Earth. It will splash down in the Atlantic Ocean at about 8:45 a.m. EST. Crew Dragon will employ an enhanced four-parachute system to touch down gently and be recovered by a brand new recovery ship. SpaceX has been tasked by NASA to recover the spacecraft and its crew not more than one hour after splashdown. The entire mission, from pre-launch to recovery, is being managed by SpaceX flight controllers, with oversight by NASA. The mission, officially named Crew Dragon Demo-1, is an important pre-cursor to the resumption of manned spaceflights launching from U.S. soil since the retirement of the Space Shuttle in 2011. Specific mission objectives include the demonstration of on-orbit applications of the spacecraft’s avionics system, docking system, communications/telemetry system, environmental control systems, solar array electrical systems and propulsion systems. Objectives also include demonstrating the performance of the guidance, navigation and control systems of both the Falcon 9 rocket and Crew Dragon spacecraft through ascent, on-orbit operations and re-entry. The demonstration flight will also measure acoustic and vibration levels and loads across the Crew Dragon interior and exterior which may affect its eventual astronaut occupants. The flight will also demonstrate the launch escape system trigger monitoring system. Crew Dragon performance from the beginning to end of the mission will be strictly evaluated by SpaceX and NASA. All of the mission data will serve to confirm that Crew Dragon can carry out its designed objective to ferry astronaut crews to and from ISS. If all goes well, there could be a launch of astronauts aboard Crew Dragon as early as July, 2019. A brief overview of the NASA Commercial Crew Program, soon to be available at www.spaceline.org, follows. The NASA Commercial Crew Program is designed to employ commercial contractors to provide astronaut ferrying services to and from the International Space Station. It began as the Commercial Crew Development Program, in which two prime contractors, SpaceX and Boeing, were contracted by NASA to provide these services. The SpaceX vehicle originated as the Crew Dragon, while the Boeing vehicle originated as the CST-100 Starliner. Crew Dragon, also known as Dragon Rider, Dragon V2 or Dragon 2, is the second version of the SpaceX Dragon family of space capsules. It is a human rated vehicle and incorporates a set of four side-mounted thruster pods, each having two Super Draco engines. These could be employed in an in-flight emergency to carry the spacecraft to a safe distance away from the booster rocket. Crew Dragon can fly atop Falcon 9 rockets. It features larger windows, new flight computers and avionics and redesigned solar arrays over that of the previous unmanned Dragon capsule. In September, 2014, NASA officially selected Crew Dragon to carry astronauts to and from ISS as part of the Commercial Crew Program contract. The Crew Space Transportation (CST)-100 Starliner is Boeing’s entry into the NASA Commercial Crew Program, intended to ferry astronauts to and from the International Space Station. CST-100 Starliner is similar, but not identical to, the NASA Orion Spacecraft under development by Lockheed Martin. It is approximately the same size as the Apollo Command Module and is designed to be flown atop Atlas V, Delta IV, Falcon 9 and Vulcan rockets. NASA selected CST-100 Starliner to be an official finalist in the Commercial Crew Program in September, 2014. One of the interesting features in the CST-100 Starliner contract in particular is the fact that Boeing will be able to sell seats to commercial space tourists once operational. Spaceline gives a hearty welcome to veteran Cape Canaveral photographer Lloyd Behrendt, who joins our team as Staff Photojournalist, effective with today’s Falcon 9 Nusantara Satu/Beresheet launch. He had been shooting for Spaceline as a freelance photographer since December, 2017. Lloyd has been shooting Cape launches since Apollo 14, with his first published work, that of the Apollo 17 launch, featured in the Melbourne Times on December 7, 1972. His roots in Cape Canaveral run deep. Lloyd’s father, Lt. Col. Lloyd L. Behrendt, was the Air Force Weather Officer for the very first Cape Canaveral launch, Bumper #8, on July 24, 1950. Lloyd recalls viewing that historic launch as a child from the Patrick Air Force Base Officer’s Club, definitely shades of things to come. Both as a staff and freelance photographer, Lloyd has shot over 500 manned and unmanned launches at the Cape. Many of his black and white images have been transformed into beautiful works of art as color photo oil paintings. Lloyd has published the book, “STS-135, Atlantis, Covering the Last Shuttle Ever”, which features his artwork and experiences covering and shooting that historic Space Shuttle mission. He is also an avid nature photographer, specializing in the flora and fauna frequenting the marsh near his home in Malabar, Florida. It is our hope that you will both enjoy and appreciate his photography at Spaceline as Lloyd begins this new chapter in his distinguished career. Three samples of his excellent work follow. A SpaceX Falcon 9 rocket successfully launched multiple payloads at 8:45 p.m. EST today from Launch Pad 40 on Cape Canaveral Air Force Station. The payloads included the Nusantara Satu communications satellite for Indonesia, the Beresheet lunar lander for Israeli non-profit organization SpaceIL and the S5 space situational awareness satellite for the Air Force Research Laboratory. The Beresheet payload was deployed about 33 minutes after launch, while the Nusantara Satu satellite with its attached S5 satellite was deployed about 44 minutes after launch. The first stage booster employed in today’s launch was being flown for the third time. It was flown previously for the Iridium-7 mission in July, 2018 and the SAOCOM-1A mission in October, 2018. Both of these launches were from Vandenberg Air Force Base, California. Today’s booster was successfully recovered on the “Of Course I Still Love You” drone ship stationed about 300 miles east of Cape Canaveral. Nusantara Satu, formerly known as PSN-6, is a communications satellite designed and built by Space Systems Loral for PT Pasific Satelit Nusantara (PSN) of Indonesia. The satellite employs solar-electric ion thrusters for orbit raising and conventional chemical propellant for on-orbit stationkeeping. It will be used for voice, video, data and broadband Internet services for the Indonesian Archipelago and Southeast Asia. The satellite has a design life of 15 years. Nusantara Satu weighed 10,439 pounds at liftoff and will be deployed in geostationary orbit at 146 degrees East Longitude about 22,000 miles above Earth. Upon reaching its proper orbit, the satellite will release a secondary payload, the Air Force S5 space situational awareness satellite. S5 weighs 132 pounds and was provided by Applied Defense Systems for the Air Force Research Laboratory. But the star of the mission remains Beresheet, formerly known as Sparrow, an Israeli lunar lander. From Hebrew, Beresheet is translated as Genesis, literally “In the Beginning”, and is the only privately funded lunar lander, with Israel becoming the fourth nation after the United States, Soviet Union and China to land spacecraft on the Moon. SpaceIL, an Israeli non-profit organization and Beresheet’s manufacturer along with Israel Aerospace Industries, was founded in 2011 to compete in the Google Lunar X Prize (GLXP). GLXP was intended to provide a $30 million cash prize for any organization capable of landing a spacecraft and performing specific maneuvers on the Moon. Although the contest ended in March, 2018 without a winner, SpaceIL continued to pursue its lunar landing ambitions with private funding. Beresheet weighed about 1,300 pounds at launch and will land on the Moon on April 11, 2019 at Mare Serenitatis. About 6 feet in diameter 4 feet high, it contains a magnetometer and laser retroreflector on a mission which will only last about two days before the spacecraft overheats, as it has no thermal protection. If successful, SpaceIL plans to study the commercial applications for similar lunar landing spacecraft. Relativity Space, a start-up rocket manufacturer and space launch provider, in association with the Air Force, has formally announced the redevelopment of long dormant Launch Complex 16 on Cape Canaveral Air Force Station. Redevelopment of the complex will commence immediately and the company could conduct it first launch there, that of its Terran I rocket, as early as late 2020. The following is an updated Launch Complex 16 fact sheet, soon to be available at www.spaceline.org. Launch Complex 16 was one of four launch complexes built in support of Titan missile testing. The complex was built at a cost of about $5 million. Construction began in 1957 with acceptance by the Air Force in June, 1958. Titan I and II test launches ceased at the site in 1963. Launch Complex 16 was reassigned to NASA in January, 1965 and redesigned as a test stand for static firings of the Apollo Service Module propulsion engine. The complex was deactivated in 1969, and NASA returned it to the Air Force in January, 1972. In 1974, due to its existing blockhouse and ample real estate, the facility was used in support of Pershing IA and ultimately Pershing II missile testing. These launches employed the blockhouse, but not the launch pad. Pershing IA and Pershing II launches took place from specialized mobile launchers located throughout the grounds. Pershing launch operations officially ceased at the site on June 1, 1988 in the wake of the Intermediate Nuclear Forces (INF) treaty with the U.S.S.R. Launch Complex 16 was subsequently abandoned, with the blockhouse and original Titan launch pad concrete launch support structures left intact. In 2019 the Air Force turned over Launch Complex 16 to Relativity Space, a start-up rocket manufacturer and launch provider. The company plans to launch its Terran I rocket from the facility as early as late 2020. The company will use groundbreaking 3-D printing technology to fabricate the rocket and its components. While much of Launch Complex 16 will be renovated, it is expected that the historic blockhouse will remain intact for Relativity Space operations. Christmas had been celebrated in space for many years now. Apollo 8, Skylab 4, STS-103 and crews aboard the International Space Station have all celebrated Christmas in space. Santa Claus actually visited Space Shuttle Discovery during STS-103, a Hubble Space Telescope servicing mission, on Christmas Eve, 1999. Mission controllers in Houston were stunned as Santa visited Discovery in the dead of night, delivering presents for the seven-member crew. But for those of us who have been around for a while, the most memorable Christmas mission remains Apollo 8, mankind’s first journey to the Moon and back. While Apollo 8 astronauts Frank Borman, James Lovell and William Anders orbited the Moon on Christmas Eve, 1968, they took time to read from the Bible’s Book of Genesis Chapter 1, verses 1 through 10, King James version. The reading was included as part of a televised broadcast, which at the time was the most watched broadcast in television history. We are now approaching lunar sunrise, and for all the people back on Earth, the crew of Apollo 8 has a message that we would like to send to you. In the beginning, God created the heaven and the earth, and the earth was without form, and void; and darkness was upon the face of the deep. And the Spirit of God moved upon the face of the waters. And God said, Let there be light; and there was light. And God saw the light, that it was good; and God divided the light from the darkness. And God called the light Day, and the darkness He called Night. And the evening and the morning were the first day. And God said, Let there be a firmament in the midst of the waters, and let it divide the waters from the waters. And God made the firmament, and divided the waters which were under the firmament from the waters which were above the firmament, and it was so. And God called the firmament Heaven. And the evening and the morning were the second day. And God said, Let the waters under the heaven be gathered together unto one place, and let the dry land appear; and it was so. And God called the dry land Earth; and the gathering together of the waters called He seas; And God saw that it was good. And from the crew of Apollo 8, we close with good night, good luck, a Merry Christmas, and God bless all of you, all of you on the good Earth. It was one of those really significant and memorable broadcasts in the history of the U.S. space program, not that secular concerns were ignored. On Christmas Day, 1968, the Apollo 8 crew performed a Trans-Earth Injection burn, which was conducted from the dark side of the Moon, out of reach of communication with Earth. Once voice contact was restored, astronaut James Lovell exclaimed, Please be informed, there IS a Santa Claus! Ken Mattingly, the Mission Control Capsule Communicator at the time, replied, That’s affirmative, you are the best ones to know! We hope this humble article brings back Christmas memories, or creates new ones. Merry Christmas from all of us here at Spaceline! A SpaceX Falcon 9 rocket successfully launched the GPS III-SV01 satellite at 8:51 a.m. EST today from Launch Pad 40 on Cape Canaveral Air Force Station. Launch was delayed five days. A launch attempt on December 18 was scrubbed due to abnormal readings from a first stage sensor. Launch attempts on December 20 and December 22 were scrubbed due to unacceptable weather, because of stormy launch site weather and high winds aloft respectively. Today’s launch occurred on time with no delays. In a departure from previous Falcon 9 launches, the first stage booster did not feature grid fins or landing legs and was not recovered. Mission requirements dictated that sufficient first stage booster fuel be kept on reserve in order to place the payload on its correct elliptical orbit, which did not allow enough fuel to support a landing. The satellite was successfully deployed about two hours after launch. GPS III-SV01 (Global Positioning System III-Space Vehicle 01) is the first in a planned constellation of ten next generation GPS satellites. The GPS III series of satellites is intended to deliver sustained, reliable GPS capabilities to America’s warfighters, U.S. allies and civilian users. GPS provides positioning, navigation and timing service to civilian and military users worldwide, with the goal of fulfilling increasing demands for the GPS system. System improvements introduced with the GPS III series include improved anti-jamming, improved accuracy and improved integrity. The satellites operate on six orbital planes at 55-degrees inclination at an altitude of about 12,000 miles. Design life is 15 years with 12 years mean mission duration. 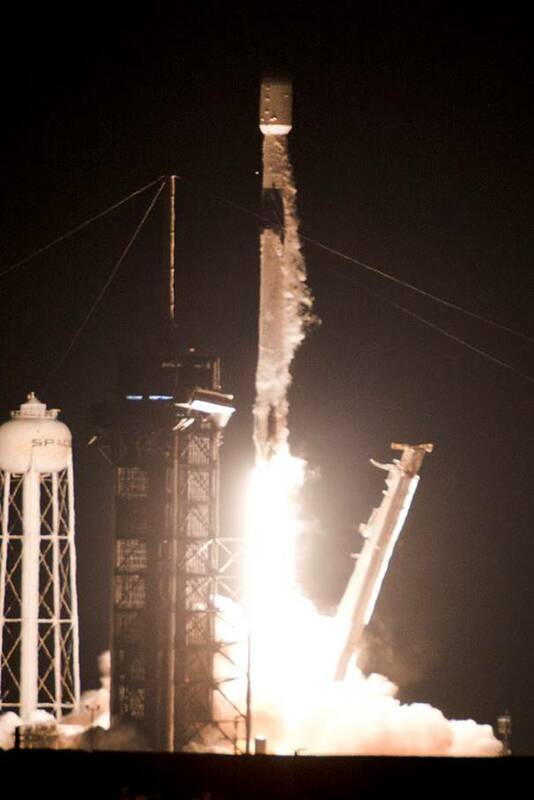 Launch weight of the satellite was about 8,000 pounds. Position accuracy is within 0.63 meters. Prime contractor for GPS III-SV01 is Lockheed Martin. A SpaceX Falcon 9 rocket successfully launched the CRS-16 payload for NASA at 1:16 p.m. EST today from Launch Pad 40 on Cape Canaveral Air Force Station. Launch was delayed one day to allow contaminated rodent food aboard the payload to be replaced. The Dragon spacecraft that supports CRS-16 has flown once before, on the CRS-10 mission in February, 2017. CRS-16 was deployed about ten minutes after launch and will dock to the International Space Station on Saturday, December 8. Today’s launch was marred only by a “non-nominal” recovery of the Falcon 9 first stage booster. The booster was intended to land at Landing Zone 1 on Cape Canaveral Air Force Station, but its grid fin hydraulic pump stalled and the booster made a water landing just offshore of the Cape instead. The booster was recovered intact and is apparently in excellent condition despite the mishap. The CRS-16 Dragon Capsule is loaded with over 5,600 pounds of supplies and equipment in support of over 250 science and research investigations conducted aboard the International Space Station (ISS). This is the sixteenth of up to 20 missions SpaceX will conduct to ISS under their first Commercial Resupply Services (CRS) contract with NASA. In January, 2016 NASA announced that SpaceX will support multiple CRS missions to resupply ISS through at least 2024 as part of a second contract award. Under the CRS contracts, SpaceX is able to provide the United States capability to deliver and return significant amounts of ISS cargo, including live plants and animals. An important variant of the Dragon spacecraft, named Crew Dragon, is under development and is intended to carry manned crews to and from ISS. As for CRS-16, Dragon will remain at ISS for about five weeks before being recovered in the Pacific Ocean carrying about 4,000 pounds of return cargo. A SpaceX Falcon 9 rocket successfully launched the Es’hail-2 communications satellite at 3:46 p.m. EST today from Launch Pad 39A at the Kennedy Space Center. Launch occurred on time with no delays. The daytime launch ended a six-month string of night launches from Cape Canaveral. The first stage booster employed today was being flown for the second time, having first flown for the Telstar-19 Vantage launch from the Cape in July, 2018. The booster was successfully recovered today on the “Of Course I Still Love You” drone ship positioned several hundred miles east of Cape Canaveral. The Es’hail-2 satellite was successfully deployed in a geostationary transfer orbit about 32 minutes after liftoff. Es’hail-2 is the second geostationary communications satellite owned and operated by Es’hailSat, a company located in the Middle Eastern nation of Qatar. The satellite offers Ku-band resources to support a wide variety of applications. It also features multi-transponder Ka-band capacity, providing businesses and government customers secure communications across the Middle East and North Africa. The satellite’s multi-mission architecture will provide content transfer, broadcast distribution, enterprise communications and a variety of government services. The satellite was built by Mitsubishi Electric (MELCO) and has a design life of about 15 years. A United Launch Alliance Atlas V rocket successfully launched the AEHF-4 military satellite at 12:15 a.m. EDT today from Launch Pad 41 on Cape Canaveral Air Force Station. Launch occurred on time with no delays. The rocket launched was the most powerful Atlas V variant, Version 551, featuring a five-meter fairing, five solid rocket boosters and a single-engine Centaur second stage. AEHF-4 is the fourth in a planned constellation of six satellites in the Advanced Extremely High Frequency (AEHF) System, a joint service geosynchronous satellite system that provides survivable, global, secure, protected and jam-resistant communications for high-priority military ground, sea and air assets. The system enables the National Security Council and Unified Combatant Commanders to control their tactical and strategic forces at all levels of conflict up to and through a nuclear war scenario. The AEHF system is a follow-up to the Milstar constellation and is intended to augment and improve existing Milstar capabilities. AEHF provides connectivity across the full spectrum of mission areas, including land, air and naval warfare, as well as special operations, strategic nuclear operations, strategic defense, theater missile defense, space operations and intelligence. The primary AEHF stated mission is to provide nearly worldwide secure and survivable satellite communications. The satellite payload consists of onboard signal processing with crossbanded Extremely High Frequency (EHF) and Super High Frequency (SHF) communications capability. The AEHF-4 satellite was built by primary contractor Lockheed Martin Space Systems Company. A SpaceX Falcon 9 rocket successfully launched the Telstar-18 Vantage satellite at 12:45 a.m. EDT today from Cape Canaveral Air Force Station Launch Pad 40. Launch was delayed just over an hour to allow clouds and lightning to clear the Cape area. The satellite was placed in a geostationary transfer orbit about 32 minutes after liftoff. The Falcon 9 first stage booster, one in a series of advanced Block 5 boosters that can be re-flown up to 100 times with refurbishment, was flown for the first time and was successfully recovered on the “Of Course I Still Love You” drone ship deployed on the Atlantic Ocean several hundred miles east of Cape Canaveral. Telstar-18 Vantage is the third high throughput satellite in the Telesat corporation’s global fleet and is the first featuring coverage of the Asia-Pacific region. Built by SSL, the satellite will replace and expand the Telesat network’s capabilities utilizing C-band capacity over Asia as well as Ku-band capacity over Indonesia and Malaysia. Located at 138 degrees East in a geostationary orbit about 22,000 miles above Earth, Telstar-18 Vantage will provide coverage including Southeast Asia, Mongolia, Australia, New Zealand and the North Pacific. The satellite is expected to enter service this fall and has a design life of 15 years. A United Launch Alliance Delta IV Heavy rocket successfully launched the Parker Solar Probe at 3:31 a.m. EDT today from Cape Canaveral Air Force Station Launch Pad 37B. Launch was delayed 24 hours due to a number of technical issues but today’s launch occurred on time with no delays. Launch of the Parker Solar Probe marks the first time a spacecraft will travel to a star. The Parker Solar Probe will use seven Venus flybys over nearly seven years to achieve orbit of the Sun. At its closest approach, the spacecraft will hurtle around the Sun at about 430,000 m.p.h. which is the equivalent of traveling from New York to Tokyo in less than a minute. Parker Solar Probe will be immersed in the Sun’s coronal plasma where temperatures can reach more than a million degrees Fahrenheit. However, the coronal plasma has such a low density that the actual heat transferred to the spacecraft will heat it to just around 2,500 degrees Fahrenheit. The spacecraft employs a 4.5-inch thick carbon-composite shield which will allow its instruments to function at a comfortable 85 degrees Fahrenheit. The spacecraft will make 24 orbits of the Sun over a period of 88 days. On its final three orbits of the Sun, the spacecraft will fly within 3.9 million miles of the solar surface, which is more than seven times closer than the current record holder for a close solar pass, the Helios 2 spacecraft, which passed within 27 million miles of the Sun in 1976. The Parker Solar Probe will employ four instrument suites designed to study electric and magnetic fields, plasma, energetic particles and will also create images of the solar wind. A primary spacecraft mission will be to aid our ability to forecast changes in Earth’s environment caused by solar activity which may affect life and technology, such as interruption of satellite service. The spacecraft will also endeavor to answer the question as to why the solar atmosphere is much hotter than its surface. The Parker Solar Probe is named after scientist Dr. Eugene N. Parker, whose investigations pioneered our modern understanding of the Sun. This marks the first time a NASA spacecraft has been named for a living individual. Dr. Parker and members of his family were on hand at Cape Canaveral to view the launch. The Parker Solar Probe is part of NASA’s Living With a Star program, managed by the NASA Goddard Space Flight Center in Greenbelt, Maryland for NASA’s Science Mission Directorate in Washington, D.C. The Johns Hopkins University Applied Physics Laboratory provided the spacecraft for NASA. Scientific instrumentation is provided by the Naval Research Laboratory, Princeton University, the University of California Berkeley and the University of Michigan. The Air Force Space and Missile Museum today hosted a Space Collectibles Show and Sale at the Sands Space History Center, located outside the southern gate to Cape Canaveral Air Force Station. About 20 vendors participated, showcasing and offering for sale everything from astronaut autographs, items flown in space, photographs, cache covers, toys and models, to ephemera of all kinds and descriptions. The annual event drew several hundred visitors, spending thousands of dollars on various space collectibles and memorabilia. While the Air Force Space and Missile Museum itself is located on restricted government property, the Sands Space History Center is open to the public. Today’s scheduled launch of a United Launch Alliance Delta IV Heavy rocket carrying NASA’s Parker Solar Probe has been scrubbed. Launch was scheduled for 3:33 a.m. EDT but was initially postponed to 3:53 a.m. EDT due to an unspecified technical issue. Launch was postponed again to 4:28 a.m. EDT due to an apparent ground system problem. The terminal countdown was halted at Launch Minus 1 minute, 55 seconds due to a gaseous helium regulator alarm. The 65-minute launch window closed at 4:38 a.m. EDT and did not leave enough room to evaluate and potentially resolve the problem and the launch was scrubbed. Launch has been rescheduled for Sunday, August 12 at 3:31 a.m. EDT again with a 65-minute launch window which closes at 4:36 a.m. EDT. There is officially a 60% chance that weather will be favorable to support a Sunday launch attempt. Launch will be from Pad 37B on Cape Canaveral Air Force Station. A SpaceX Falcon 9 rocket successfully launched the Merah-Putih satellite at 1:18 a.m. EDT today from Cape Canaveral Air Force Station Launch Pad 40. This marked the first re-flight of a Falcon 9 Block 5 first stage booster, designed to be launched as many as 100 times with periodic refurbishment. The first stage booster launched today was flown previously on the Bangabandhu-1 mission in May, 2018. The booster was successfully recovered with a landing on the “Of Course I Still Love You” drone ship located on the Atlantic Ocean several hundred miles east of the Cape. The Merah-Putih satellite was successfully deployed in a geostationary transfer orbit about 32 minutes following launch. The Merah-Putih satellite will be guided to a geostationary orbit about 22,000 miles above Earth at an orbital position of 108 degrees east. Built by Space Systems Loral (SSL), Merah-Putih will be integrated into the PT Telkom Indonesia’s network to provide service to Indonesia, South and Southeast Asia. Merah-Putih, standing for the red and white colors in the flag of Indonesia, carries C-band transponders which can support a wide variety of communications applications. The satellite has a design life of 15 years. PT Telkom is the largest telecommunications and network provider in Indonesia, providing services including fixed wireline connections, cellular services, internet and data communication. A SpaceX Falcon 9 rocket successfully launched the Telstar-19 Vantage satellite at 1:50 a.m. EDT today from Launch Pad 40 on Cape Canaveral Air Force Station. Launch occurred on time with no delays. This was the second launch of the Falcon 9 Block 5 version, featuring a first stage booster that can be re-flown up to 100 times with refurbishing. The first stage booster launched today successfully landed on the “Of Course I Still Love You” drone ship located several hundred miles off the Cape. The Telstar-19 Vantage satellite was successfully deployed in a geostationary transfer orbit about 32 minutes after liftoff. Telstar-19 Vantage is the latest in a new generation of Telesat satellites that combine broad regional beams and powerful high throughput satellite spot beams in a design optimized to serve the types of bandwidth intensive applications increasingly in demand by users worldwide. Its Ku-band coverage includes Brazil, the Andean region and the North Atlantic. Its Ka-band coverage includes South America, the Caribbean, the North Atlantic and Northern Canada. Telstar-19 Vantage is scheduled to enter service this summer. Built by Space Systems Loral (SSL), the satellite has a design life of 15 years. Sometimes, all of the stars line up. They did this morning as a SpaceX Falcon 9 rocket carried the CRS-15 payload into space. At first it seemed like a routine night launch with darkness prevailing, but then something wonderful happened. A few minutes after liftoff, the pre-dawn sunrise caught the smoky trail of the rocket as it lofted high above the Atlantic Ocean. Not only did a brightly colored trail emerge, but so did a rare event – the development of a bright white halo around the rocket. 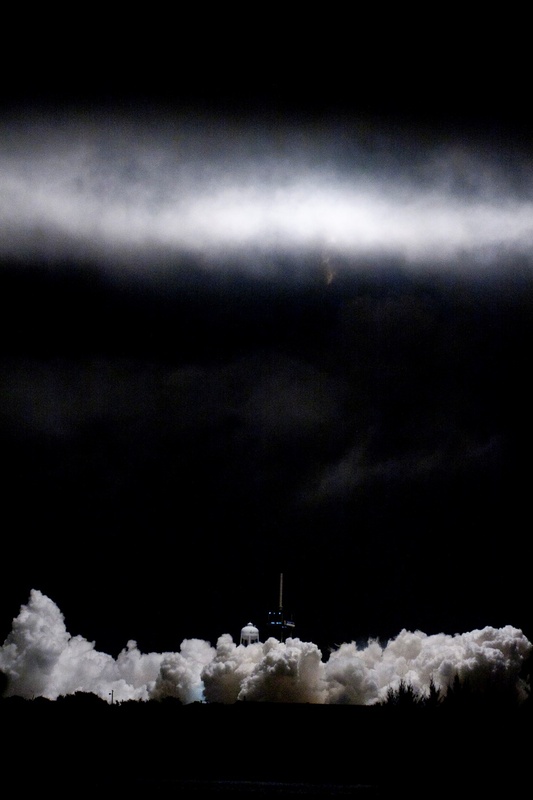 It started as a bright white teardrop, but then expanded to a large white circle with the rocket’s second stage burn highly visible at its bottom. Indeed, the rocket was visible for over 8 minutes after launch, a very rare occurrence. 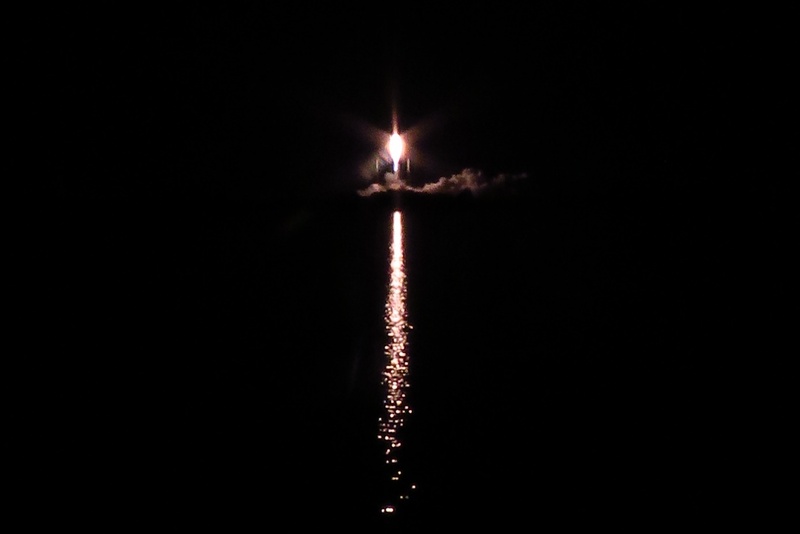 This was the most spectacular unmanned launch I have ever seen in my 40 years covering the Cape. Thanks to SpaceX and NASA for the show! A SpaceX Falcon 9 rocket successfully launched the CRS-15 payload for NASA at 5:42 a.m. EDT today from Launch Pad 40 on Cape Canaveral Air Force Station. The CRS-15 payload consists of a SpaceX Dragon capsule carrying about 6,000 pounds of supplies and equipment bound for the International Space Station (ISS). The Dragon capsule was successfully deployed about 9.5 minutes after launch. Dragon is set to arrive at ISS on July 2. Two of the main elements of the Falcon 9 were flown previously. The first stage booster was flown on the NASA TESS mission in April, 2018 while the Dragon capsule was flown on the CRS-9 mission in July, 2016. The first stage booster flown today was not recovered as it had a design life of just two launches. The Dragon capsule will return to Earth carrying 4,000 pounds of cargo in a month. In addition to supplies and experiments, the Dragon capsule carries a new Canadian-built Latching End Effector (LEE). LEE will replace a failed unit astronauts removed from the Canadarm2 robotic arm in 2017. Each end of Canadarm2 has an identical LEE, used to grapple payloads and cargo spaceships and walk to various ISS locations. In collaboration with the National Park Service, a toy dog representing a Newfoundland that accompanied Lewis and Clark on their historic expedition is being flown to help NASA and the National Park Service celebrate two important anniversaries in 2018. The National Park Service commemorates 50 years since the beginning of the National Trail System in 1968 and NASA commemorates 60 years since the start of the space agency in 1958. 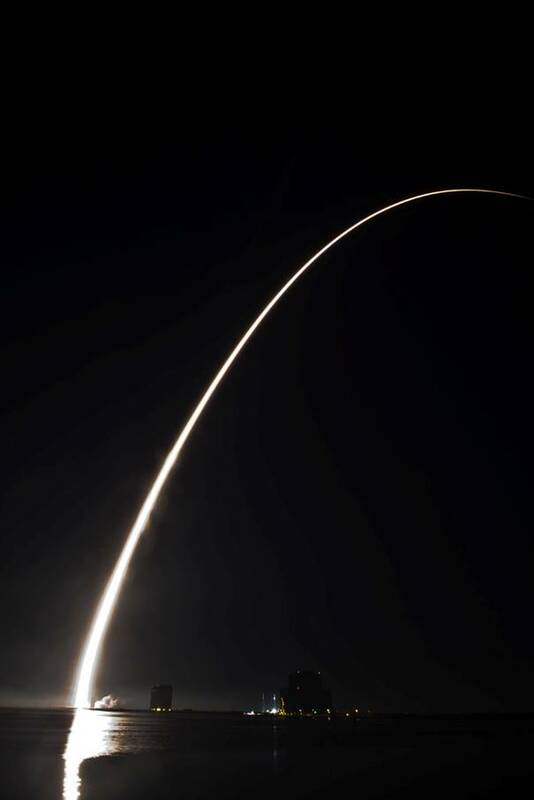 Veteran Cape photographer Lloyd Behrendt has released a stunning photo of Monday’s Falcon 9 flight. 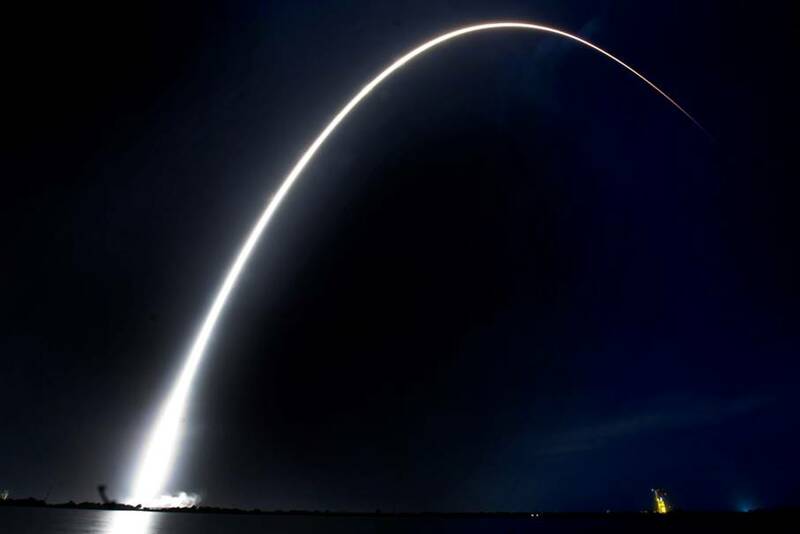 Behrendt, who has photographed hundreds of launches at Cape Canaveral Air Force Station and the Kennedy Space Center, captured the photo below a few minutes after the launch of the Falcon 9, which was launched at 12:45 a.m. EDT Monday June 4 into crystal clear skies. The photo captures the Falcon 9 in flight just seconds before booster engine cutoff. The extreme color of the rocket’s fiery trail and the distinctive “fan” of the rocket’s nine first stage engines make this one of the most outstanding rocket photos we have ever seen. Behrendt and his business partner Liz Allen are contributing photographers for Spaceline. A SpaceX Falcon 9 rocket successfully launched the SES-12 commercial communications satellite at 12:45 a.m. EDT today from Launch Pad 40 on Cape Canaveral Air Force Station. Launch was originally scheduled for May 31 but was postponed to allow engineers time to troubleshoot a potential problem with the rocket’s second stage. The Falcon 9 first stage booster was previously flown on the OTV-5 mission in September, 2017. An attempt to recover the booster today was not made, as it had a design life of two launches. Today’s launch was flawless, and the SES-12 satellite was successfully deployed on a Geostationary Transfer Orbit (GTO) about 32 minutes after liftoff. Owned and operated by Luxembourg-based SES, SES-12 will allow the company to provide high performance capacity, greater reliability and flexibility for video, data, mobility and government services to the Asia-Pacific and Middle East regions. Employing six wide beams and 72 high throughput user spot beams, SES-12 is one of the largest satellites owned by SES. The satellite also employs a Digital Transparent Processor to provide customizable bandwidth services to SES customers. The all-electric SES-12 satellite was built by Airbus Defense and Space, and employs electric propulsion for orbit raising and on-orbit maneuvers. The electric propulsion system dramatically reduced the weight of the satellite as it does not require fuel tanks and liquid fuel. Once operational, SES-12 has a design life of 15 years. A SpaceX Falcon 9 rocket successfully launched the Bangabandhu-1 satellite from Kennedy Space Center Launch Pad 39A at 4:14 p.m. EDT today. Launch was postponed 24 hours due to a ground system abort triggered during the countdown of a launch attempt on May 10. The Falcon 9 first stage booster successfully landed on the “Of Course I Still Love You” drone ship on the Atlantic Ocean about 340 miles southeast of the Cape. The Bangabandhu-1 satellite, operated by the Bangladesh Communications Satellite Company Limited, is the first geostationary communications satellite for the nation of Bangladesh. Built by Thales Alenia Space, the satellite weighed about 8,000 pounds fully fueled and has a design life of 15 years. It will provide a variety of communications services to the Asia region. 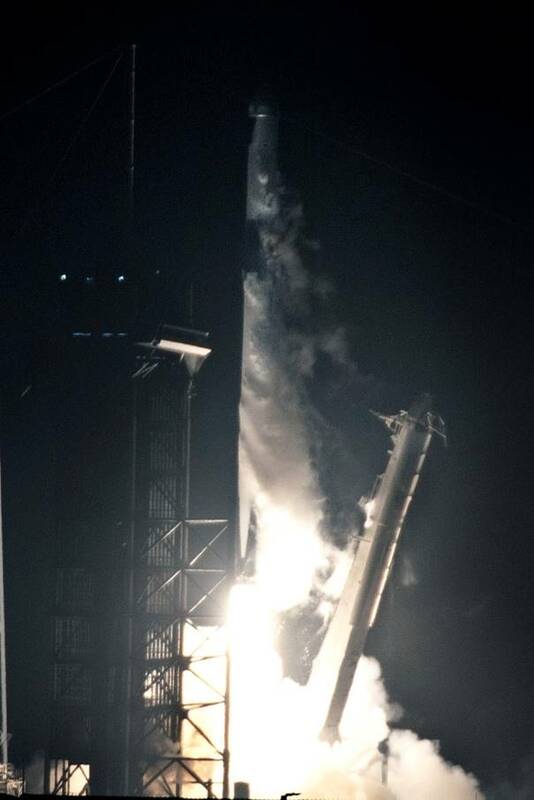 This was the first launch of the Falcon 9 Block 5 version. The Falcon 9 Block 5 Version incorporates innovations to help increase the speed of production and enhanced re-usability. Block 5 first stage boosters are designed to fly ten times with only inspections in between launches, and might be able to fly up to 100 times with periodic refurbishment. This dramatically increases the pool of available first stage boosters, allowing SpaceX to provide a larger flight manifest with quicker turnaround between launches. The Block 5 version looks in every way similar to previous versions of the Falcon 9, with the exception that the interstage between the first and second stages is unpainted and appears black. Specific Block 5 enhancements include an increase of seven to eight percent thrust made possible by uprating the Falcon 9 Merlin engines. An improved flight control system for booster landings decreases the amount of fuel needed for descent. Endurance for first stage re-usability is provided by a re-usable heat shield which protects the engines and plumbing at the base of the rocket, more temperature resistant titanium grid fins and a thermal protection coating on the first stage to limit damage from re-entry. A set of retractable landing legs affords rapid recovery and shipping. The Block 5 incorporates improvements necessary to assure its use in the NASA Commercial Crew Program and various U.S. National Security missions. 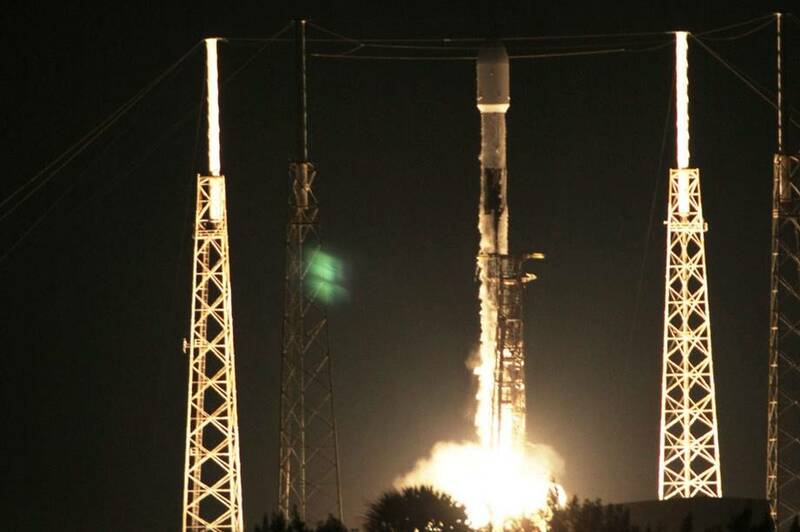 Launch of a SpaceX Falcon 9 rocket carrying the Bangabandhu-1 communications satellite for the nation of Bangladesh has been scrubbed. Launch was originally scheduled for 4:12 p.m. EDT today. The launch time was delayed twice, the first time to 4:42 p.m. EDT and the second time to 5:47 p.m. EDT. A specific reason for the delays was not announced. A “standard ground system auto abort” was triggered just 60 seconds before the scheduled 5:47 p.m. EDT launch attempt. With the launch window set to expire at 6:22 p.m. EDT there was not enough time for engineers to determine the cause of the abort and a scrub was called. The next launch opportunity is Friday, May 11 at 4:14 p.m. EDT with the launch window extending to 6:21 p.m. EDT. There is a 60% chance of favorable weather for a Friday launch attempt, with a concern for possible thick cloud cover at launch time. Launch will be from Kennedy Space Center Launch Pad 39A. A SpaceX Falcon 9 rocket successfully launched the Transiting Exoplanet Survey Satellite (TESS) for NASA at 6:51 p.m. EDT today from Cape Canaveral Air Force Station Launch Pad 40. Launch was delayed two days to give engineers time to study issues related to the rocket’s guidance, navigation and control system. TESS is scheduled to fly by the Moon on May 17 and use the body as a slingshot toward its ultimate High-Earth Orbit, a highly elliptical orbit with a low point of 67,000 miles by a high point of 233,000 miles. TESS should be able to achieve its working orbit by mid-June. The Falcon 9 first stage booster launched today was successfully recovered on the “Of Course I Still Love You” drone ship located in the Atlantic a few hundred miles east of the Cape. TESS is an Explorer-class planet finder. In the first-ever spaceborne all-sky transit survey, TESS will identify planets ranging from Earth-sized to gas giants, orbiting a wide range of stellar types and orbital distances. The principal goal of the TESS mission is to detect small planets with bright host stars in the solar neighborhood, so that detailed characterization of the planets and their atmospheres can be performed. TESS will monitor the brightness of more than 200,000 stars during a two-year mission, searching for temporary drops in brightness caused by planetary transits. Transits occur when a planet’s orbit carries it directly in front of its parent star as viewed from Earth. TESS is expected to catalog more than 20,000 transiting exoplanet candidates. TESS should provide prime targets for further, more detailed characterization with the upcoming James Webb Telescope, as well as other large ground-based and space-based telescopes in the future. The legacy of TESS will be a catalog of the nearest and brightest stars hosting transiting exoplanets, which will comprise the most favorable targets for detailed investigations in the coming decades. TESS team partners include the Massachusetts Institute of Technology (MIT) Kavli Institute for Astrophysics and Space Research, NASA Goddard Space Flight Center, MIT Lincoln Laboratory, Orbital ATK, NASA Ames Research Center, the Harvard-Smithsonian Center for Astrophysics and the Space Telescope Science Institute. Launch of a SpaceX Falcon 9 rocket carrying the NASA Transiting Exoplanet Survey Satellite (TESS) payload previously scheduled for 6:32 p.m. EDT today has been scrubbed. SpaceX said a scrub was called to allow engineers to perform additional testing of the rocket’s guidance, navigation and control system. Additional information was not released. Launch has been tentatively rescheduled for Wednesday, April 18 at 6:51 p.m. EDT. Launch will be from Launch Pad 40 on Cape Canaveral Air Force Station. TESS is a NASA satellite designed to locate planets orbiting stars in the solar neighborhood. A United Launch Alliance Atlas V rocket successfully launched the Air Force Space Command-11 (AFSPC-11) payload at 7:13 p.m. EDT today from Cape Canaveral Air Force Station Launch Pad 41. The Atlas V was launched in the 551 configuration, featuring a five-meter payload fairing, five solid rocket boosters and a single-engine Centaur second stage. This is the most powerful version of the Atlas V, capable of producing about 2.6 million pounds of thrust at launch. The ASPC-11 payload consists of two satellites sent directly to geosynchronous orbit, bypassing a geostationary transfer orbit typically employed in this type of mission. The satellites reached their proper geosynchronous orbit 22,300 miles above Earth about six hours after launch. The forward satellite is the Continuous Broadcast Augmenting SATCOM (CBAS), considered the primary satellite of the two launched. CBAS is designed to augment existing military satellite communications capabilities by broadcasting military data continuously through space-based satellite communications relay links. The aft satellite is the Evolved Expendable Launch Vehicle Secondary Payload Adapter (ESPA) Augmented Geosynchronous Laboratory Experiment (EAGLE), which carries a variety of Space Test Program (STP) experiments. ESPA incorporates six slots capable of holding up to six separate attached small payloads. One of the more interesting EAGLE experiments is a small, free-flying satellite named Mycroft, after the brother of fictional sleuth Sherlock Holmes. Mycroft will be released and fly to a distance of about 21 miles from EAGLE, then return to rendezvous with EAGLE at a distance of about 3,300 feet. The experiment will study methods of surveying, cataloging and inspecting satellites in geosynchronous orbit. The AFSPC-11 mission is managed by Air Force Space Command, based at Los Angeles Air Force Base, California. A SpaceX Falcon 9 rocket successfully launched the CRS-14 mission for NASA at 4:30 p.m. EDT today from Cape Canaveral Air Force Station Launch Pad 40. The rocket carried a Dragon capsule bound for the International Space Station (ISS) under the NASA Commercial Resupply Services (CRS) contract. The Dragon capsule is set to be berthed at ISS on Wednesday, April 4. Both the Falcon 9 first stage booster and Dragon capsule flown today are flight proven. The first stage booster supported the CRS-12 flight in August, 2017 and the Dragon capsule supported the CRS-8 flight in April, 2016. The first stage booster flown today was not recovered, but was successfully used to test recovery methods for future launches. The Dragon capsule will splash down in the Pacific Ocean carrying about 4,000 pounds of cargo after a month-long stay at ISS. The Dragon capsule launched today carries nearly 6,000 pounds of supplies, equipment and scientific research elements to crew members living and working aboard ISS. Scientific investigations carried will examine severe thunderstorms on Earth, the effects of microgravity on the production of high-performance products from metal powders, and growing food in space. Dragon also carries cargo for research in the National Laboratory, operated by the Center for the Advancement of Science in Space (CASIS), which includes testing of how the harsh environment of space affects materials, coatings and components, identifying potential pathogens aboard ISS and studying an antibiotic releasing wound patch. Specific scientific investigations include the Atmosphere-Space Interactions Monitor (ASIM) which from its perch outside the European Space Agency Columbus module will study severe thunderstorms and lightning in Earth’s atmosphere and upper atmosphere. Metal Powder Fabrication will be studied by the NASA Sample Cartridge Assembly (MSL-SCA-GEDS) while the Testing of Materials in Space will be studied by the Materials ISS Experiment Flight Facility (MISSE-FF). The patching up of wounds with a patch containing an antimicrobial hydrogel that promotes healing and growth of regenerating tissue is carried and methods of developing drugs in space will also be studied. Other CASIS experiments flown include Budweiser Barley Germination designed to test methods for growing barley in microgravity, Comparative Real-time Metabolic Activity Tracking, Genes In Space Education Program, as well as other scientific investigations. A small satellite to be deployed from ISS is also being carried. The RemoveDebris experimental satellite, built by British company Surrey Satellite Technology Limited, employs a net and a harpoon to capture space debris which will be hauled to burn up in Earth’s atmosphere. The satellite will itself deploy two smaller satellites which will act as space debris targets. RemoveDebris will employ a dragsail to provide aerodynamic resistance in the upper atmosphere. The satellite should be deployed from ISS later this year. A SpaceX Falcon 9 rocket successfully launched the HISPASAT 30W-6 commercial communications satellite at 12:33 a.m. EST today from Launch Pad 40 on Cape Canaveral Air Force Station. Launch was originally scheduled for February 25 but was postponed to allow troubleshooting of a payload fairing pressurization issue. The rocket’s first stage booster was not recovered, but it did, however, fire its landing burn engines which were visible several hundred miles away in a crystal clear sky. The booster was not expected to survive its ocean “landing”. Recovery on a barge at sea was not possible due to high seas in the Atlantic Ocean which did not allow the landing barge to leave Port Canaveral over the weekend. This was a bit disappointing to SpaceX, as the first stage booster used in this launch was being flown for the first time. Built by Space Systems/Loral and having a design life of 15 years, HISPASAT 30W-6 is a commercial communications satellite operated by Madrid-based Hispasat, the world’s leading provider in the distribution of Spanish and Portuguese content. The satellite will be deployed in a geosynchronous orbit at 30 degrees West and will offer a range of services, including television, broadband, corporate networking and other telecommunications products. It features 40 Ku band transponders, 6 Ka band beams and 10 C band transponders. HISPASAT 30W-6 will serve Europe, the Mediterranean, the Americas and northwest Africa. 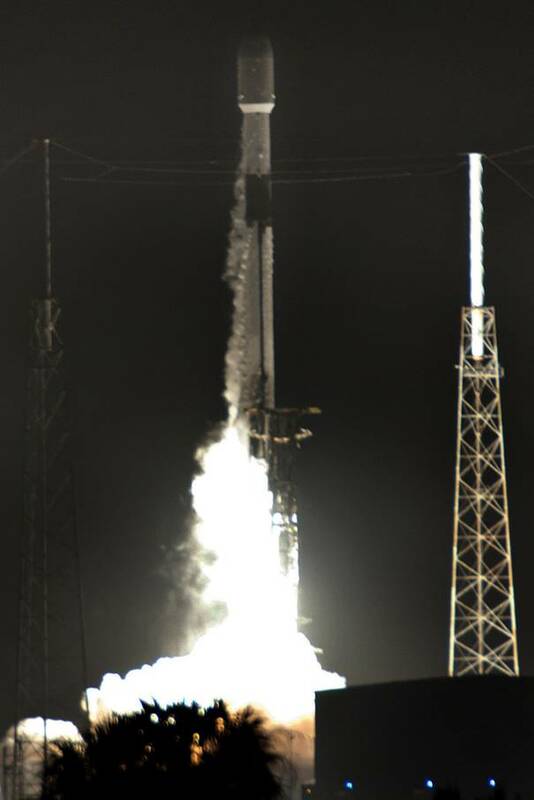 Fully fueled, the satellite weighed about 13,000 pounds at launch. Roughly the size of a city bus, SpaceX says this is the largest satellite they have ever launched. A United Launch Alliance Atlas V rocket successfully launched the GOES-S weather satellite at 5:02 p.m. EST today from Launch Pad 41 on Cape Canaveral Air Force Station. Launch was on time with no delays either to the launch date or launch time. The 197-foot tall Atlas V was launched in the Version 541 configuration, featuring a five-meter fairing, four solid rocket boosters and a single-engine Centaur second stage. The vehicle can produce over 2 million pounds of thrust at launch, and can carry a maximum 18,270-pound payload to Geostationary Transfer Orbit (GTO) or a maximum 38,400-pound payload to Low-Earth Orbit (LEO). GOES-S is the second in the most sophisticated family of National Oceanic and Atmospheric Administration (NOAA) Geostationary Operational Environmental Satellites (GOES) known as the GOES-R Series. The first satellite in the family, named GOES-R, was launched from Cape Canaveral on November 19, 2016. The series is designed to provide advanced imagery and atmospheric measurements of Earth’s Western Hemisphere, real-time mapping of lightning activity and improved monitoring of solar activity and space weather. GOES-R, renamed GOES-16 when it achieved geostationary orbit, serves as NOAA’s operational GOES-East satellite. GOES-S, which will be renamed GOES-17 upon reaching geostationary orbit, will serve as NOAA’s operational GOES-West satellite. The two satellites combined will be able to monitor from the west coast of Africa west as far as New Zealand. The GOES-R Series of satellites can scan the Earth five times faster with four times the resolution and three times the number of channels over previous GOES satellites, supporting more accurate and reliable forecasts and severe weather warnings. Images taken include weather patterns, hurricanes and severe storms updated as frequently as every 30 seconds. The satellites carry the first operational lightning mappers flown in geostationary orbit, providing data on both in-cloud and cloud-to-ground lightning in support of increased lead time for severe thunderstorm and tornado warnings. The satellites also host a suite of instruments that improve the forecasting and detection of approaching space weather hazards such as solar eruptions and magnetic field variations which could potentially disrupt power utilities, communication and navigation systems and cause radiation damage to orbiting satellites. As GOES-West, GOES-17 will be positioned to monitor the western United States, Hawaii, Mexico, Central America, parts of South America and much of the Pacific Ocean. GOES-17 will also greatly improve geostationary coverage of Alaska and surrounding high-latitude areas. “Advertised” advantages of GOES-17 include more and better data covering the northeastern Pacific Ocean where many of the weather systems affecting the continental United States originate, better fire detection and intensity estimation, improved detection of low clouds and fog, improved tropical cyclone track and intensity forecasts, advanced monitoring of atmospheric river events that may cause flooding and mudslides, better monitoring of smoke and dust, improved air quality monitoring as well as support of improved transportation safety and aviation route planning.